In light of our recent discussions about c-sections and VBACs, I just came across two birth stories on this blog. The woman's first birth was a cesarean section, and her second was a UBAC (unassisted birth after cesarean). An inspiring read. 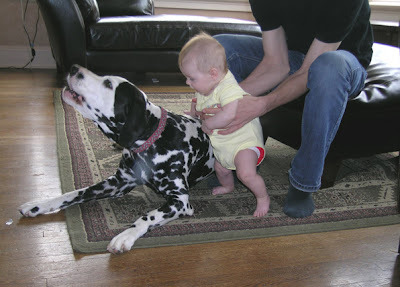 Zari's recent fascinations: standing up whenever her feet hit a surface, playing with Zeke, and grabbing her feet. My sister-in-law designed this business card. Oooh, I like it a lot too! Now I can't decide which I like best. I've received so much demand for my slings that I make that I decided to become "official" and make business cards. I'm still working on them, but here's a preliminary design. 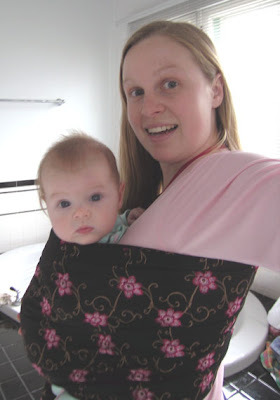 I make ring slings ($35) and pouch slings ($30), by the way. I'm also starting to delve into the world of mei tai type carriers. Some day I will create a website, but for the moment I've posted the fabrics I have in stock at http://secondwomb.blogspot.com. I suppose I could sell them on Etsy...another thing to do, right? Anyway, I'd appreciate comments or suggestions for the business card design. Thing is, this shouldn't be news at all! Doctors and midwives have known this for hundreds of years. Anne Frye's textbook Holistic Midwifery extensively documents this, if you want more detailed information. 1. The picture. Okay, I see lots of gowned people surrounding a newborn baby. Where is the MOTHER??? Why isn't the baby on her chest??!! Images like these reinforce the idea that birth is a medical procedure, and that the mother is really not all important in the whole process. It reminds me all too much of the Monty Python sketch I posted earlier. 2. Researcher Eileen Hutton's quote: "It's an intervention that has the potential to have a (positive) impact on a large number of babies and at a very low cost. 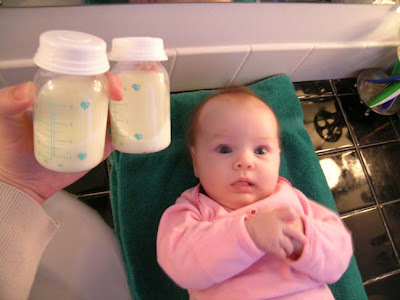 This benefits the baby without any real down sides for mom." NOT cutting the cord is an "intervention?" I vehemently disagree. Clamping and cutting the cord is the intervention; leaving the cord intact is simply normal human physiology. I am also trying to push ahead with my dissertation. I am currently writing one of the early chapters, very slowly, since I can only work when Zari naps. I worked on my chapter outline today and think it is coming together quite well. I will also borrow some of the essays from this blog and intersperse them between each of the chapters. become "Dr. Rixa" by Christmas!!!! I recently bought Dr. Sarah J. Buckley's book Gentle Birth, Gentle Mothering. It is fantastic--well worth the money. She writes about birth and mothering as both a mother of four children and as a physician and scientist. She makes a compelling argument for undisturbed, instinctive birth. If you cannot find the book in your local library, which is likely since it is published in Australia, you can read many of her articles on her website. If you are pressed for time, read this one first. Here are some excerpts from a chapter called "Healing Birth, Healing the Earth." The problem in our times is that the passion of birth is neither recognized nor accommodated. Birth has become a dispassionate medical event, usually occurring in a setting that discourages emotional expression. If we are to reclaim our birthing passion, we must give ourselves permission to birth passionately and we must choose our birth setting and birth attendants with this in mind. Birth in these circumstances will be more straightforward, with less need for interventions, helping us to step into new motherhood with confidence and grace. I've got a bee in my bonnet over this incredibly myopic article about breastfeeding: "Nursing Mothers Don't Appeal to Everyone." 1) "I don't like the way you eat, so you should eat in the bathroom." 2) "Mother's milk is like poop." 3) "Only brown people in third-world countries breastfeed." 4) "Some nursing mothers were rude to me after I gave them dirty looks." I have lots of adjectives swimming around in my head to describe this man's attitude, but I had best not post them in a public forum. I can't wait until Hathor the Cow Goddess gets her hands on this one. Sweet! Now I am a "far-out obsessive." I get a kick out of the idea that allowing an involuntary bodily function to happen is somehow extreme. Sure, DIY brain surgery would be extreme. Or for that matter, a DIY cesarean. Ouch! ...and I just put syrup taps into our maple tree. The sap is finally flowing after a long cold spell. I rigged up some plastic tubing so that the sap flows through the tubes & through the lid of the collection bucket. That way miscellaneous things like twigs or bugs can't get in. Zari has figured out how to grab things and put them in her mouth. Fingers are a favorite--hers or ours. 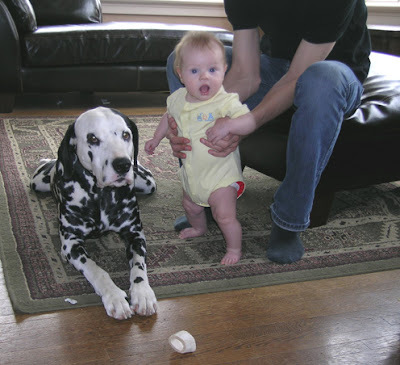 She also likes playing with small stuffed toys, which means we have to tell Zeke all the time: "no, not for you." A friend lent me a play gym for Zari. She likes to bat the toys around and--of course--put them in her mouth. I just started putting Zari on her Baby Bjorn Little Potty this week, and she LOVES it! She used to fuss frequently when I peed her over the toilet. Now, she sits contentedly on the potty, kicking her legs and looking around. We are doing even better with EC because she will happily go whenever I offer. I just came across a few interesting articles about cross-nursing (nursing other people's babies): "Breast Friends" and a response to the article: "She Breastfed My Son." I also found this British article called "Not Your Mother's Milk." I've never thought it was weird, but I guess some people really freak out at the idea. My little sis in fact has a good friend due around the same time, and they've talked about nursing each others' babies if the need arises. For example, if they are watching each others' kids and the other baby becomes hungry, they will simply nurse the baby! It's something I wouldn't do with a stranger or casual acquaintance, for health reasons. But with close friends or siblings, I wouldn't even blink if they asked me to. In fact I would be honored. Donating breastmilk is similar, but since it's not given directly from the source, people don't have as much of the "yuck" reaction. Would you do this for a friend or sibling? Would you mind if your friend nursed your own baby? What I pumped a few mornings ago...I often get 6-8 oz during my morning pumping session, after Zari is done nursing. The love I have for Zari is unlike anything else. My love for my family members is an undercurrent that never disappears, but it often gets lost beneath the flow of activities and wildly different personalities jumbled together. With my husband, my love takes on changing forms. Of course there’s romantic love. It’s important but certainly not the foundation of a marriage, as movies make it out to be. Sometimes it’s a deep sense of friendship and camaraderie. I notice this most when we’re working on a project together: perhaps repainting our guest cottage or assembling an oil filtration system for our Greasecar. At other times it’s a raw sharing of our innermost selves. Occasionally our love manifests itself as irritation or annoyance when we try to imprint our wills too strongly on the other person. With Zari, I just love her. Deeply and simply. To say “I feel love for her” is inaccurate. When we feel something, it implies that there is an object outside or separate from ourselves: I feel the wind on my face. My love for Zari is unlike any other. I don’t have to work on it, like I do with my family. It doesn’t take on changing forms, as with my husband. It just is. It always will be. That love cannot be separated from my existence. 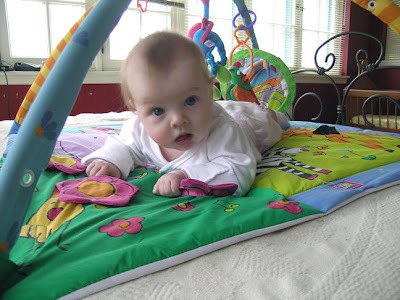 Our physical link began to end when we cut her cord 2 ½ hours after she was born. As long as she nurses, we will not have severed those ties completely. But the love I hold for her—the love that is part of me, that is me—will forever keep me bound to her.